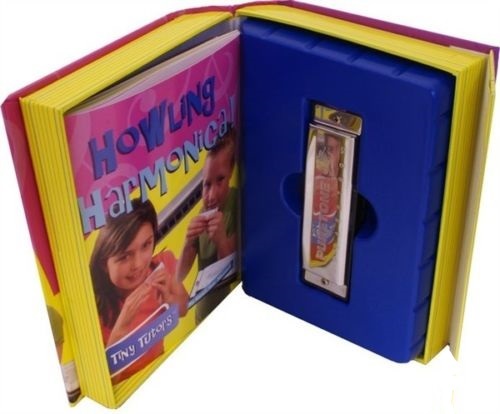 Howling Harmonica! is attractively packaged to resemble a colourful children’s book. Inside is a metal Puretone harmonica and also an extremely useful tutorial manual. 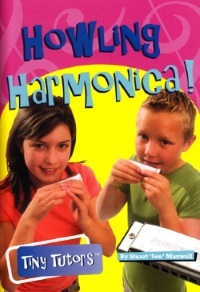 The publishers, Tiny Tutors, also have packages for the Ocarina and Kazoo. We love this product for two simple reasons. The harmonica, though basic in quality, is responsive enough for the job, while the manual is well thought through and well presented. 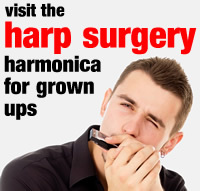 As an entry level instrument, beginners will find their Puretone harmonica a comfortable instrument to use. It is reasonably air-tight and sympathetic when played. We did find things a little bit spongy on the blow reeds, but it’s a good instrument nonetheless. 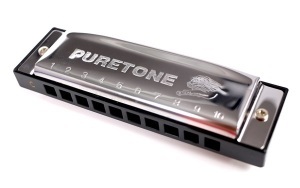 The Puretone has standard gauge air channels, which means that learners must master the embouchure necessary for standard ten hole harmonicas straight away. That’s good! The forty eight page manual is packed with useful information and is sensibly structured. The introductory pages cover the history of the instrument, how to breathe, and how to hold it, before exploring first sounds. Our only criticism here is that some chugging could have been included to help build basic breathing technique. But this isn’t the focus of the book. Using Frère Jacques, the manual quickly tackles the need for understanding musical notation. It moves through note values, time signatures and pitch, and then looks at harmonica tab. Three complete song lesson follow; The Saints, The Yellow Rose Of Texas and Skip To My Lou. 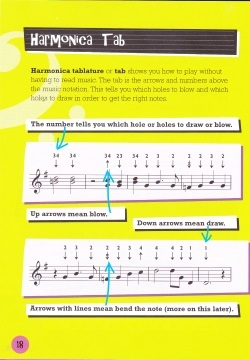 What’s interesting, is that the music and tab includes double stops as well as single notes. We like this as it promotes the concept of self-harmonisation. The middle section addresses note bending, hand effects and vibrato, with Amazing Grace and Brown Girl In The Ring as study pieces. Note bending is what lies at the heart of the manual. Amazing Grace is played in the lower octave, which means mastering the draw bend in hole three. The next topic is special effects, with trains, hound dogs and chickens. The Train Blues study piece focuses on timing and train effects, but also includes a range of bends. Users might benefit from something on line they could listen to, for a true idea of how the piece goes. The last section covers some more new tunes; Twinkle, Twinkle, O Christmas Tree, Row, Row, Hush Little Baby and My Bonnie Lies Over The Ocean. These are more basic tunes and might have been better placed earlier in the manual, but they are also a good place to end for those who find the bending section too taxing. Howling Harmonica! combines standard notation and harmonica tab as part of a highly enjoyable learning process. Arguably it tackles note bending a little too early, but that may not be such a bad thing. Bending adds an extra twelve note options to the diatonic harmonica after all. And this may well be why this product was given its name. The manual is set out very nicely with some amusing imagery and clear use of graphics and colour. You can find your own affordable copy at Amazon.